Food supplement. The age-old all-in-one superfood, captured in a revolutionary formula with the strongest effect on the market. If you aren’t satisfied with the product, you can return the box to us within 30 days, in accordance with our satisfaction guarantee, and we will refund you. Handled, shipped and delivered in 3-5 working days. After years of intense research, researchers have come to the conclusion that curcumin is a proper all-in-one superfood that benefits the entire body and can alleviate many different conditions. While extremely beneficial, curcumin alone is not that readily absorbed into the human body. And if it doesn’t enter your bloodstream, it’s impossible for your body to use it (i.e., it's not bio-available). Luckily, we’ve found a perfect solution that allows your body to utilise curcumin! Using a completely new approach to enhancing its bio-availability, we’ve combined curcumin with micelle, a liquid, water- and fat-soluble carrier that helps deliver it into the bloodstream. That way, we get to maximise curcumin bio-availability and ensure the best possible absorption. Discover the best turmeric supplement on the market! We took the age-old multipurpose remedy and combined it with the latest scientific findings to produce one of the best all-in-one curcumin supplements yet. With the power of the revolutionary curcumin formula, ALL IN A DAY Curcuma clearly outperforms other similar products on the market! In this remarkably effective formula, the efficacy of the highly bioavailable curcumin is further enhanced by vitamin D3. I used to have problems concentrating at work, but no more. Now I can finally see things clearly! It’s amazing, wish I tried it sooner. Over the past few years, I used to get sick quite often – colds, flus, you name it. Thanks to ALL IN A DAY Curcuma, I’ve finally managed to boost my immune system and take control of my body. Will definitely continue using it. My joints used to hurt all the time, which really made it difficult for me to spend quality time with my grandchildren. ALL IN A DAY Curcuma made all the difference. Now I can practically chase them around in the backyard and I’m feeling great. Fantastic product! Regular use for best results. 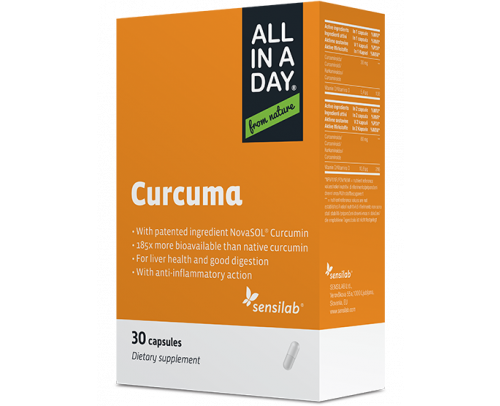 Get your daily dose of ALL IN A DAY Curcuma and find the relief you’ve been looking for. Ingredients: High quality curcumin formula [polysorbate, curcuma longa rhizomes extract with 6% curcuminoids, cholecalciferol], antioxidant: L-ascorbic acid, capsules: hydroxypropyl methylcellulose. 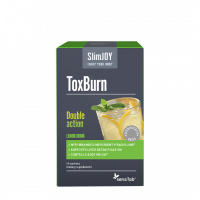 Contains a high-quality curcumin formula from Germany. Use: The recommended daily intake is 1-2 capsules with 2 dl (a glass) of water after a meal. Warning: If you are sensitive or allergic to any of the ingredients of the product or you are taking any medication, you should consult your doctor before use. This product is not recommended for pregnant or breastfeeding women. important:The recommended daily intake should not be exceeded. Dietary supplement should not be used as a substitute for a varied and balanced diet and a healthy lifestyle. A diverse and balanced diet and a healthy lifestyle are important. Storage: Keep out of reach of children! Store in a dark and dry place at a temperature below 25°C.